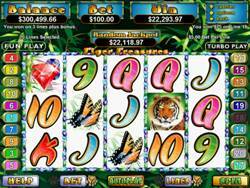 Tiger Treasures Slot Information, Screenshots and which online casinos offer Tiger Treasures Slot for Play. Collect all the cash in the deepest darkest jungle! 5 Reel, 20 Payline Progressive Video Slot with a Multiplier, Free Spins and a Jackpot win. This slot is based on the ancient legend that deep in a lost jungle lie the ruins of a civilization rich with treasure. These treasures are guarded by a majestic, ferocious Bengal Tiger. The difference with this slot is that it doesn’t pay only from left to right, but right to left as well. There is also a random Progressive Jackpot which can be won after any spin. Tiger, Panda, Butterfly, Orchard, Diamonds, Ruby, Sapphire,Chinese Symbols, Ten, Jack, Queen, King and Ace. Coin amounts start from $0.01 to $5, play on all 20 paylines to reach the highroller $100 per spin. The Wild will substitute for all other symbols, except the scatter symbol. The Wild will only appear only on Reels 2 and 4, and winning combinations will be tripled. 3 or more Scatters from left to right or vice versa will be awarded from 5 up to 25 Free Spins. While the Reels are spinning for free, Tigers will be added on Reels 2, 3 and 4. The Free Spins feature can be re-triggered at any point. This Jackpot can be won at the end of any spin. It continues to grow and the more time spent playing the better the chances of a big win. Tiger Treasures Slot takes you on a trip into an exotic world full of stunning graphics and roaring sound effects. Many people have a great love for both Pandas and Tigers, especially due to the fact that they’re an endangered species. The game also has a Chinese influence with the scattered Chinese symbols. Enjoy the adventure of finding the hidden treasure!